In David Ayers war film Fury, Sergeant Don 'Wardaddy' Collier (Brad Pitt) leads his troops during the last months of World War II, in the titular Sherman tank, as the Allies commence with their final assault on Nazi Germany. When the original assistant of the Fury dies in battle, Collier is assigned a new one: Howard (Logan Lerman), an Army typist who has never experienced warfare battle. Wardaddy and his crew disdain him for his incompetence, but soon the intensities of war force them to stick together, and force Howard to rethink his morals and conform to the severity of what they are up against. 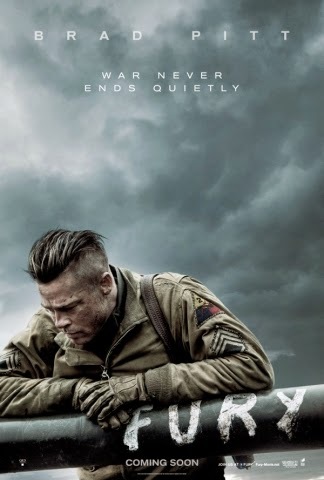 Unsurprisngly, Fury doesn't glorify war, nor does it lighten the content to appeal to wider audiences. This is an honest and violent portrayal of the last global conflict; the essence of fear, the sheer violence, and the utter lack of compassion from both sides is conveyed to help us realise just how relentless it can be. Despite focusing principally on the Allies, the script never renders them to be exceptional heroes; they may believe they are, but this arrogance leads them to carry out senseless killings and convey racial hatred. The same can be said for the opposing Nazis - and in the end, this violent and honest depiction of warfare is just as engaging as it is disturbing. This violence is also excellently staged in thrilling battle scenes, full of tension and satisfaction as the protagonists fight their ruthless enemies. The intense portrayal is further enhanced by some superb performances, particularly Pitt and Lerman, but also the rest of the team including Shia LaBoeuf, Michael Pena, Jon Bernthal, and Jason Isaacs in a smaller role. Their performances convey the tough outer shells of these men who deep down are terrified of the warfare experience, and as we see them comfort the dead and mercilessly kill the Nazis who they are sworn to fight, we see just how tragic the effects of war can be on these people. At the end of the day, Fury is a brilliant but acquired taste; it's very intense, though perhaps not on par with Saving Private Ryan or similar war films, and as we near the second act things drag out, but it's still respectful and unrestrained in its story of men stranded in a corrupt and violent part of human history.